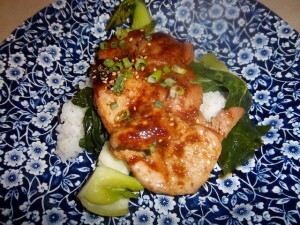 Lemon ginger pork: My creation, with charred baby pak choy and Japanese rice. No husband noice but it was oishi (delicious!). So this is how bad it’s been: I watched Mamma Mia the other day. This is my go-to, I -don’t-remember-when-I-last-felt-loved-or-appreciated movie. I laugh. I cry. I dance. It’s not pretty. But it works for me. And then, for good measure, I watched an old movie you have to see if you have the heart of a romantic at all: Brief Encounter. So British. So touching. So stiff upper lip. So heart-rending. I cried. Felt a million bucks better. Meanwhile, I am beginning work on two new books and I feel like I have twins. Just when you get one changed, fed, burped and down, the other one cries. And they’re very different books, so I feel schizophrenic. And so do I. Made a thing I’m quite proud of and got another thing working that will either be wonderful or awful. Not sure and no time to work on it right this minute. The proud thing is ginger broth: Just bring a big, sliced, no need to peel, hunk of ginger to a boil in 2-3 cups water. Turn it off. Steep and infuse. Use the broth instead of having to peel, cut, smash, mince or grate. Keep it in the fridge. Use it with dashi or other Japenese broth for soups or ramen or saimin or whatever. Doesn’t work for everything but I made a killer Yuzu Pork the other night with it instead of sake (which I didn’t have any and anyway, I try to keep booze out of the house or I’d drink whatever it is until I was insensible). Here’s kind of what it was (because, on top of all that’s happened in the past two weeks, my hard drive died; lost two years of work; including last week). I’m sitting shiva and praying for a hard drive rescue miracle. Pork in marinade; don't overdo. Less than a pound made two meals for two. 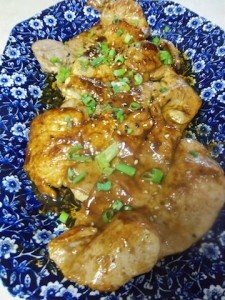 Yuzu Yaki One: Take some thin-sliced pork loin or pork chop. Very thin. Make a mixture of 1 tablespoon yuzu (bottled, more on that later), 2 tablespoons shoyu (Hawaii kine is sweeter), 2 1/2 tablespoons mirin (if you don’t got, use sugar), 2 tablespoons ginger broth, 1 tablespoon vegetable oil. 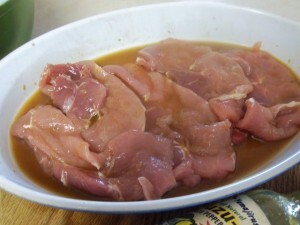 Marinate one hour (don’t do it too long or the yuzu will cook the meat). Get a frying pan really hot with 2 tablespoons peanut or vegetable oil. Drain and fry the meat very quickly (I mean two minutes max!) until it’s golden to brown, turn and repeat. Have hot rice ready. And the charred choy I talked about (or any leafy vegetable, oven-broiled to a slight, singed, brown crustiness with the thicker parts still tender). Is this not beautiful, or what? For a harried home cook, anyway. Plunk rice on plate. Plunk greens on top. Plunk pork on top. You can drizzle the pan juices over if they haven’t burned. Okay, now about yuzu. Yuzu is a Japanese citrus you can’t get most places outside Japan. There are bottled products, somewhat adulterated but not bad. I tried this with a product called Yuzu-It by Yamajirushi. Bad idea. 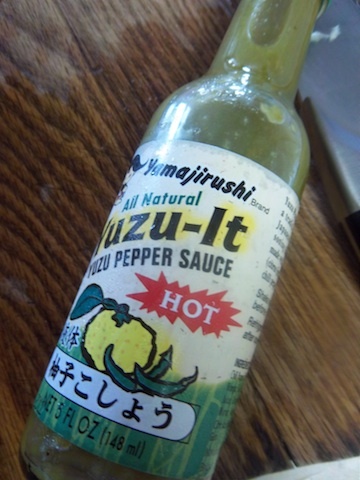 Because, although I love the stuff, it’s a yuzu chili sauce, and the hot was a little wrong. 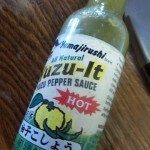 I’m going to get some bottled yuzu and I am going also going to redo it with 1 lemon’s worth of zest in the marinade. Then you’ll get the lemon and not get hit with HOT on the second bite. I didn’t get the husband noise. I got enthusiastic eating. Silent. I got eating all my leftovers. I got no noise. I am getting the damned noise if it’s the last thing I do. YuzuiIt. But don't, for this recipe. But if you can find some, get it. With sashimi, it's the bomb! Shoga, by the way, is not ginger. It’s a cousin, a young, rosey bud of ginger-like something that you can’t get easily, either. 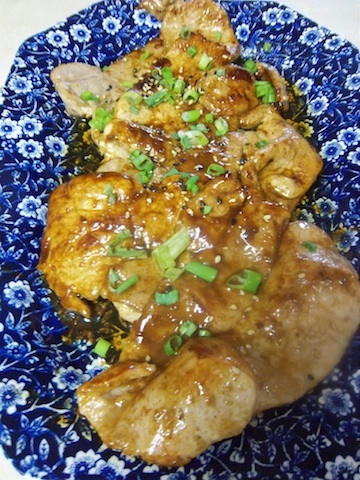 But I don’t think the first time I had ginger pork it was shoga, I think it was superfinely grated ginger. And I can’t find my ginger grater (it’s a little ashtray looking thing of porcelain with needle-sharp points sticking up and you rub the ginger—and generally your knuckles—over it and get ginger that’s not fibrous but not as searingly spicy as ginger juice, which is what you get if you grate with a regular grater, then squeeze. To the person who put my ginger grater away in the wrong place, grrrrrr). I can’t believe I’m giving yuzu-shoga-ginger lectures at 1 a.m. but I CAN believe that little cat thinks it must be dinnertime. Because for him, life is all dinnertime. Thank you very much for the ginger broth idea! I do Japanese green tea that way: Pour nearly-boiling water over Japanese organic green tea leaves and sliced ginger (no need to peel). Steep, and drink. Ginger flavor gets spicier as it sits on the stove keeping warm. And I am like you about alcohol in the house: if it’s there I will drink it until it’s gone, hehe. Your blog is a mainstay of mine, Wanda. May your present issues be resolved in the best way for you. I remember your writing about that ginger grater, — how many years ago? Gotta be there somewhere. When I can’t find something, its because Hubby was helping out. I just look in the most illogical place and there it is. Learned a lot from you today — yuzu and shoga, plus that great recipe. Thanks. Because you were talking about lemons and lemon zest, I want to tell you about True Lemon, a new — to me — product www dot truecitrus dot com slash products dot html I had thought about telling you about it before, but I thought, nah, Wanda probably has a lemon tree in her yard and doesn’t have to pay up to $1 APIECE for lemons like on the mainland. I found this product and have been using it on everything that I would have added lemon juice to — and I use a lot of lemon juice. (But I refuse to buy the bottled lemon juice because of the preservatives.) I even sprinkle lemon juice (and now True Lemon) on grocery store tomatoes to make them taste more real. Last night I made a lemon cake from a mix (gluten-free with chestnut flour), and I wanted a lemony icing for it. I mixed some powdered sugar, a couple of T. of water and a couple of dashes of True Lemon, and it was just the right flavor. True Citrus also makes crystallized orange and crystallized lime, but haven’t tried them yet. By the way, received my copies of ‘Big Happiness,” which Hubby took right from the amazon box, and is halfway through, and “A Sweet Dash of Aloha.” Happy to see my FAVORITE dessert on page 34: Okinawan Sweet Potato – Haupia Pie. Also very happy to see so many gluten-free recipes. Good luck on that hard drive. I hope you’re looking around for someone to recover the data from your dead HD. It’s too much to lose for sure! Don’t toss it until then, OK? How about chopping them up very fine and just aiddng them to other dishes like say rice mixed with other veggies that have strong flavors. You could try frying them with onions, a little garlic and butter and a bit of olive oil and use them as a steak or chicken topper.